Aaron Sorkin, who wrote The Social Network and whose new movie Steve Jobs now goes into wide release, capitalizes on our bottomless interest in the founder of Apple. At the same time — and perhaps in contradictory fashion — Sorkin asks us to accept that he’s not trying to give us a factual portrayal of Jobs’ life. Of course, artists are entitled to take license with the facts as they search for larger truths, but — let’s be honest — had Sorkin focused his movie on a tremendously successful but often callous executive named Barney McBride — his project might never have been greenlit. I say all this by way of telling you that I can’t totally buy into Sorkin’s approach (expressed in a Charlie Rose interview) that he’s not replicating real people, but creating characters — within limits, of course. Sorkin’s screenplay draws on Walter Isaacson’s much-lauded 2011 biography. Whether Steve Jobs reflects the reality of the real person in full or only in part can be assessed business historians, but Sorkin’s screenplay — brought to the movies by director Danny Boyle — charts a lively, if not entirely satisfying, course during three clearly demarcated acts. Those three acts are constructed around backstage events preceding the launch of three products: the Macintosh computer in 1984; the NeXT cube in 1988 and the iMac in 1998. Sorkin script spends a lot of time on the fraught relationship between Jobs (Michael Fassbender) and his daughter Lisa. It’s not that Jobs’ relationship with Lisa (he initially denied paternity) is irrelevant to understanding the man (or the character in the movie), it’s more that Sorkin may be off base in thinking that this father/daughter tug-of-war is the most telling thing about Jobs. It’s a telling thing. We also get a little too much of Jobs’ irritation at being asked for money by Lisa’s mother (Katherine Waterston). Sorkin’s great strength is dialogue, so Steve Jobs includes lots of conversations that take place with the rapid fire insistence of a mouse click as we meet the characters who most interest Sorkin. There’s also Joanna Hoffman, Apple’s marketing genius, who’s portrayed by Kate Winslet. Hoffman seems to be the one character who’s able to speak truth to Jobs’ power. If the corporate aspects of the movie have a moral center, it belongs to Steve Wozniak, played with patience and determination by Seth Rogen, a nice piece of casting. Woz, as he’s called, constantly asks Jobs to do the right thing by acknowledging the team that created the Apple II, the computer that kept the company profitable for a long time. Fassbender approaches Jobs as a control freak who must juggle 50 different balls at one time, all in the high-stakes atmosphere of a product launch. To this end, Fassbender ably conveys Jobs’ focus, intensity and intelligence. The movie’s product-launch backdrop may be the most telling thing about it. Sorkin and Boyle (Slum Dog Millionaire) make it clear that Jobs understood theatrics. I suppose that’s part of the point: Jobs could humanize high-tech products, but not himself. 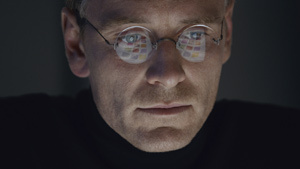 By the movie’s final act, Jobs has donned the jeans and black turtle necks that became something of a trademark. He has refashioned himself as a kind of god who brings products down from the digital mountaintop and reveals them to the masses. Steve Jobs is worth seeing because Sorkin is a clever writer, because the performances are sharp enough to match the brisk pace that Boyle sets, and because much of the byplay is entertaining. I love the fact that Sorkin takes a shot at Jobs’ vaunted design sense when, in the final going, Lisa — now a Harvard student played by Peria Haney-Jardine — compares the first iMac to a child’s Easy-Bake oven. Apple users may get more excitement out of a real Apple product launch than they do from a movie that follows on the heels of a documentary about Jobs (The Man in the Machine) and a 2013 bio-pic that cast Ashton Kutcher as Jobs. Ultimately (and perhaps unfortunately) Sorkin underscores the movie’s message: In a climactic scene, he has Woz tell Jobs that it’s possible to be both a genius and a compassionate person at the same time. “It’s not binary,” says Woz. Those words needn’t have been spoken. They’re like an exclamation point on a conclusion that Sorkin should have let us draw for ourselves, and they made me wonder whether the movie shouldn’t have been given a subtitle: Steve Jobs, The Nagging of a Genius.